Expose yourself to the bassoon! Bassoon Brothers in Prison: The Bassoon Brothers had a very “captive” audience when they played in this prison. We have an ultimate mission to attract more players and interest in what is the most versatile and magnificent musical instrument–the bassoon and the family of ‘oons. We wish for the public to quit calling it an oboe and through your help and our efforts we hope to accomplish this miracle. Although we don’t always take ourselves seriously, the Bassoon Brothers do have a very serious mission: to prevent the extinction of this extremely versatile but endangered instrument and to encourage its performance by popularizing the bassoon through our music. Click here to watch the Bassoon Brothers on Oregon Public Broadcasting’s Oregon Art Beat! 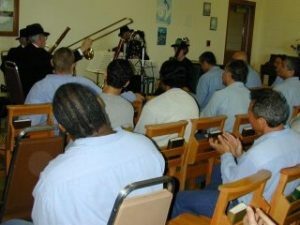 Our performances are accessible to people of all different types, even the inmates you see here! That’s Brother Mark playing the tromboon, a cross between the bassoon and trombone. Whether on the stage of the Arlene Schnitzer Concert Hall in Portland, Oregon, or in a gymnasium in a back country high school, our goal is to captivate our audience and show people what the bassoon can really do. We’re feeling responsible for….the BASSOONIST SPRING. Through our 3 quartet recordings Wanted, Captured and Escaped, and our musical derangements we’ve inspired new generations of bassoonists throughout the world to take up the belching bedpost. 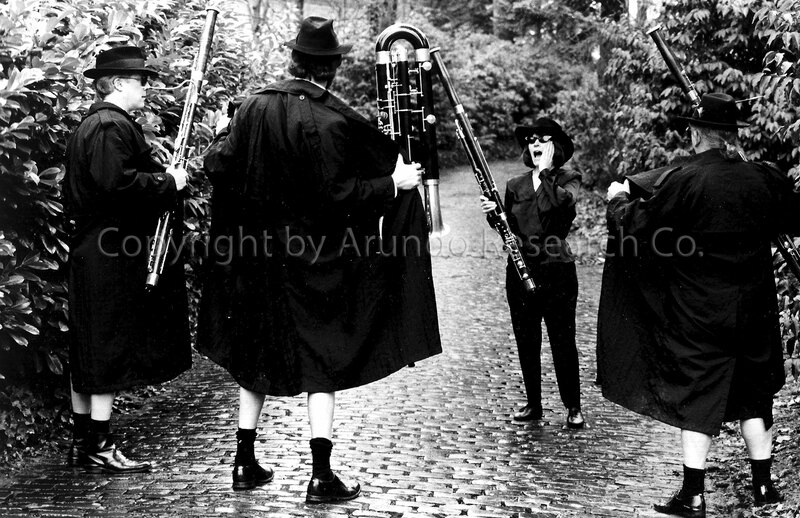 We hope you’ll seek out the many wonderfully creative bassoon quartets posting on YouTube who dress up and have fun with bountiful bassoon bonding found in these varied chamber ensembles. Some dress up their bassoons with Christmas tree lighting or the Breaking Winds 4 Lady Gagas with wigs or skits with their favorite movie characters. Dorothy, you are pretty cute and really way Over the Rainbow. What fun. Keep the B.S. coming! Through the Bassoon Brothers educational outreach program we are encouraging students to take up the instrument. Only the bassoon and contrabassoon are in common usage today. 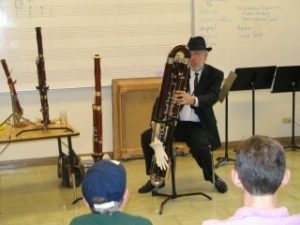 The Bassoon Brothers and our brothers and sisters in England and Germany are encouraging younger players to take up the smaller instruments of the family. Specifically the tenoroon and sopranoon. Teachers are starting elementary school age children on these instruments. Peter Schickele invented some unusual instruments. “One of the instruments is the tromboon, which I discovered in junior high school, and I was fooling around in a typically chaotic class. I had taken up the bassoon and found that the bocal, the mouthpiece part of a bassoon, could fix into a trombone in place of a trombone mouthpiece. The tromboon produces a sick cow sound, but you can control it, and it has a certain weird range. It’s been one of my best standbys and most popular instruments.” Click here to view source.